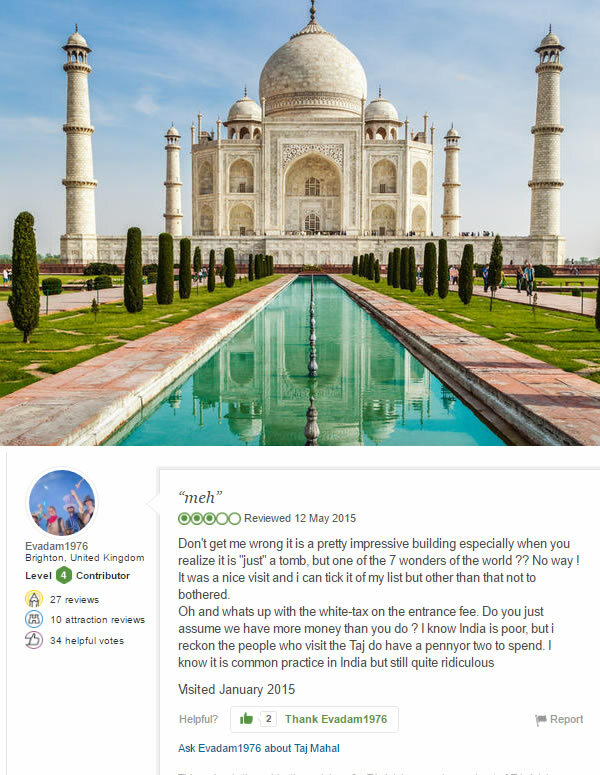 TripAdvisor is the Google of the travel world – a vast behemoth you can’t afford to avoid. People used to go there for honest, unbiased reviews of hotels, restaurants, and activities by fellow travellers. Not anymore. The bigger it gets, the less trustworthy it gets. Remember what happened to Goliath, the giant that everyone thought was invincible? While you can’t ignore TripAdvisor completely, you don’t have to depend upon it. Here are some of the biggest pain points for companies dealing with TripAdvisor, and how we’d suggest you take back control of your user-generated content. There’s nothing stopping your competitor setting up a fake profile on Tripadvisor and penning themselves a glowing review. And then popping over to your page and leaving a 1* hatchet job. In fact, anyone can qualify as a “top” or “senior” reviewer on TripAdvisor simply by dashing off a few reviews. There’s an entire “reputation management” industry out there — hired guns writing fake reviews on behalf of other companies or sabotaging their competitors. Tripadvisor says it has algorithms that can spot fake reviews, but in practice it’s impossible: in 2015 an Italian magazine made up a restaurant and got it to No. 1 in the local restaurant ratings. 14% of 25-34 year olds have admitted to writing fake reviews. Fun, right? Until you think of the business reputations they’ve destroyed. And once the review is out there, it’s hard to undo the damage. TripAdvisor makes it really hard for businesses to remove fake reviews – you have to fill out a multiple choice form, explain what has happened and then wait and see whether any action is taken for each and every case. Fake reviews are such a problem on TripAdvisor that in 2012 the company was banned from claiming that its reviews were trustworthy by the British Advertising Standard Authority. The site can no longer claim that it contains “reviews you can trust” or “honest” opinions from “real travellers”. So consumers take TripAdvisor reviews with a pinch of salt. Our own study suggests that 75% are concerned about reading fake reviews on “open review” sites. This lack of trust undermines the trust in all the reviews on the site, even the bona fide 5* write-ups that your company has worked so hard to get. As trust declines, so do bookings. So your travel business is ultimately at the whim of fake reviewers and online trolls. You can take back control from TripAdvisor by using a third-party review solution with a closed platform. This means no “write a review” buttons or open submissions. Here at Reevoo we believe in collecting reviews only from genuine customers by sending them a review request, removing the possibility of fake reviews. By engaging all customers, not just the passionate few, we generate a more accurate and positive overall score, and a higher turnover of fresh and up-to-date reviews. So unlike TripAdvisor’s collection of “top reviewer” badges, which could actually encourage people to bulk up their review count with a bit of fakery, the Reevoo badge stands for trust. There are always some customers, who, whether malicious, mischievous or just plain grumpy, decide they want to trash your business by leaving a malicious review. Sometimes bad reviews can be good for business but with open review systems you can’t even be sure they’re real customers. Then there are the irrelevant reviews or complaints. Reviews are meant to be opinions of a product or service, so comments like “I complained over 2 weeks ago and haven’t received a response” or “I won’t be happy until you give me a refund” don’t help the customer make a rational purchase decision. Complaints like these shouldn’t be on a reviews panel, and yet TripAdvisor is full of them and other nonsensical reviews. Irrelevant reviews and complaints get in the way of genuine reviews and can be frustrating for the customer. You can get round the problem by generating your own reviews on a closed platform and using human moderation. Here at Reevoo, all reviews are moderated by native language speakers. Once we ensure that a review is relevant, informative and inoffensive, we publish it – no matter what the score is. A few years ago the BBC interviewed TripAdvisor’s founder and chief executive, Steve Kaufer. An awkward interview with TripAdvisor's founder and chief executive, Steve Kaufer. Bill Turnbull hit the nail on the head at the end there — most of the photos on TripAdvisor are of bathrooms. What possesses people to upload them? Along with the meaning of Brexit and the popularity of Ed Sheeran, this surely has to go down as one of the great mysteries of modern life. Where are all those inspiring photos that are going to persuade customers to make purchases? Photos like this? The images customers put on TripAdvisor don’t necessarily reflect the most visually compelling or inspiring aspects of your business. We proactively ask customers to send the types of photos that your brand wants to collect. Contacting these people personally means they’re often willing to respond. And because they know their photos might be seen by lots of people, they’re selective about what they send in. No more bathroom photos — instead, inspirational, authentic photos taken by the people who have actually been there. 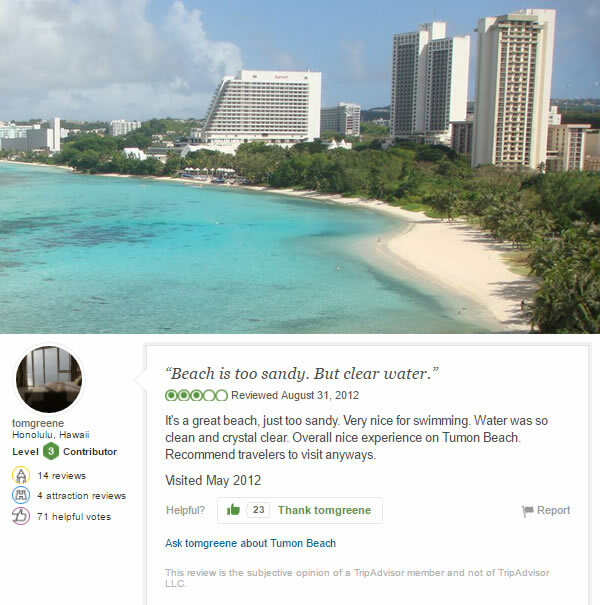 TripAdvisor uses all those reviews it has to boost its own SEO – bullying you out of search results. It’ll do anything it can to get people on its site instead of landing on yours, because every time someone makes a booking via Tripadvisor, the company gets a commission. Ker-ching! Paying commissions to TripAdvisor reduces your profits. To avoid this, you need to hope that people land on your site from the outset. What’s the solution? To embed customer content on your own site. Reevoo hosts user-generated content on client’s own website, boosting our clients’ SEO and keeping visitors on the site, driving up bookings as a result. There’s no incentive for us to funnel the customer away to a different site in order to line our own pockets. TripAdvisor introduced an analytics platform in 2015. The problem is, it’s not based around your metrics – only TripAdvisor’s. It can tell you how many times people have searched for your business or the number of reviews you’ve collected, but not the things that matter for your brand. It won’t give you insights into the effect your reviews are having on your business — if they’re driving more sales, or affecting your Net Promoter Score. Reevoo’s analytics platform provides you with these insights. Our clients can keep track of how the reviews on their site are driving up bookings. And because we ask your customers how likely they would be to recommend your business to others, we can also generate your Net Promoter Score and let you monitor it in real time…as well as creating bespoke analytics platforms tailored to your specific needs. Want to find out more about how Reevoo can help? Get in touch. Constantly on a plane for business and pleasure, Jaz is truly passionate about the possibilities that new technologies can bring to the travel sector - particularly how user-generated content can enrich the customer journey.